Taking a major step toward an eventual robotic mission to Europa, a moon of Jupiter believed to harbor ice-locked lakes and a vast sub-surface ocean, NASA has selected nine sophisticated instruments for a solar-powered spacecraft designed to find out whether the hidden realm could support life of some sort, agency officials said Tuesday. While the instruments are not designed to directly detect the presence of life, however it might be defined in Europa's case, studying the chemistry of the icy world and the constituents of water that makes it to the moon's cracked surface and the space above it could at least show whether the moon is habitable. "Europa is one of those critical areas where we believe the environment is just perfect for potential development of life," said Jim Green, director of planetary science at NASA Headquarters. "This mission will be that step that helps us understand the environment and hopefully, give us an indication of how habitable the environment could be." That alone would be a major achievement. But if the yet-to-be-named spacecraft does, in fact, find life or even indications of life, "that will be an enormous step forward in our understanding of our place in the universe," Green said. "If there's life in the solar system, and in Europa in particular, it must be everywhere in our galaxy. So understanding these questions (is) important." Discovered by Galileo in 1610, Europa was first seen in detail by NASA's aptly-named Galileo orbiter in the 1990s. During 14 flybys of the moon, one of four discovered by the Italian astronomer, the spacecraft's cameras revealed a strange world with very few impact craters, implying a young, constantly resurfaced crust. The pictures also showed huge iceberg-like blocks of ice, long crack-like structures and a pervasive "brown gunk" visible along fracture lines and across chaotic regions resembling cracked and re-frozen terrain, areas where possible hydrothermal vents on the ocean floor below, powered by tidal flexing in Jupiter's titanic gravity, have provided heating. "Europa harbors a deep, salty ocean below a thick mantle of ice," said John Grunsfeld, NASA's director of space science. "The images show a cracked, even tortured surface. One of the amazing features of Europa is that we see very few craters, indicating it's a very young surface. Something is causing it to be turned over. The age is perhaps only about 50 million years. Tidal forces from Jupiter must be causing some dynamics that result in the surface being in contact with that undersea ocean." Recent images from the Hubble Space Telescope show signs of what may be plumes of water escaping and spewing into space like watery volcanoes, possibly part of the mechanism that resurfaces the moon. "Europa is just one of many icy moons in our solar system that are likely sites of subsurface oceans," Grunsfeld said. "For Europa, that ocean may have been in existence for billions of years, since the creation of the solar system. In that ocean, of course, is water, salty water, organics and likely sources of heat, such as undersea vents that we see here on Earth. All of those components are the kinds of contributors that we believe are necessary ingredients for life to emerge." 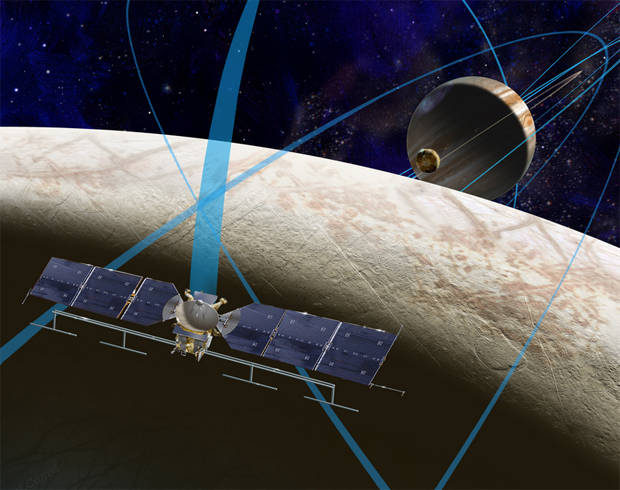 Spurred by Congress and widespread scientific interest, NASA has been studying the requirements of a Europa mission for the past several years. Various mission concepts have been reviewed but the selection of an instrument package marks a major step forward. NASA plans to spend about $110 million on instrument design and development over the next three years. While it's too soon to say with any certainty what an eventual mission to Europa might cost, Green said the spacecraft is expected to run somewhere in the neighborhood of $2 billion, not counting the cost of a launch vehicle. NASA hopes to get the mission off sometime in the 2020s, depending on future budgets and continuing congressional support. The solar powered spacecraft would be launched into an orbit around Jupiter, using the planet's gravity and that of its moons to constantly adjust the probe's trajectory, setting up at least 45 close-range flybys. The trajectory will ensure the spacecraft and its sensitive electronics remain outside of Jupiter's dangerous radiation belts as much as possible. Europa program scientist Curt Niebur said the instruments will answer the habitability question by breaking it up into "more manageable chunks:"
-- How deep and salty is the sub-surface ocean? -- How thick is the ice crust above it? -- How active is the crust? -- What is the pervasive "brown gunk" seen on the surface? -- What is the nature of the plumes spotted by Hubble and what role do they play? "This payload will answer all of these questions and help us take great strides forward in understanding the habitability of Europa," Niebur said. The Plasma Instrument for Magnetic Sounding (PIMS) will measure the thickness of the ice crust, the depth of the ocean and its salinity while an instrument known as Interior Characterization of Europa using Magnetometry (ICEMAG) will use a magnetometer to measure the moon's magnetic field and work with PIMS to determine the nature of the presumed ocean. The Mapping Imaging Spectrometer for Europa (MISE) instrument will map the distribution of organic compounds and other materials to determine the ocean's overall habitability while the Europa Imaging System (EIS) will provide high-resolution wide- and narrow-angle views of nearly the entire surface. A sophisticated ice-penetrating radar known as the Radar for Europa Assessment and Sounding: Ocean to Near-Surface (REASON) will "see" beneath the crust to chart its structure and interface with the ocean below. The Europa Thermal Emission Imaging System (E-THEMIS) will act as a heat detector, helping scientists identify areas along fissures and other structures on the surface where heat from below is making its presence felt. Another instrument, the Mass Spectrometer for Planetary Exploration/Europa (MASPEX) will measure the composition of the surface and the hidden ocean by characterizing gases that has escaped the moon's surface and interior while the Surface Dust Mass Analyzer (SUDA) will study ejected dust particles. An Ultraviolet Spectrograph (UVS) will look for watery plumes like those spotted by Hubble. "They could find indications of life, but they're not life detectors," Niebur said. "We currently don't even have consensus in the scientific community as to what we would measure that would tell everybody with confidence this thing you're looking at is alive. Building a life detector is incredibly difficult." It would be "wonderful," he said, "if we would see chlorophyll like you see in Earth plants, but we're not going to see chlorophyll. Mother nature is not going to be that kind to us. It would be great if would see fossilized bones sticking up out of the surface. That's not going to happen. Mother Nature's not going to be that kind to us. "Finding evidence of life is very nuanced, it's very delicate, it's very difficult to do," he said. "Even if you go out to a lake or Earth's ocean and grab up a scoop of water, signs of life don't immediately jump out at you. So it's going to take some very smart people sitting around working together over the next few years to come to build upon this work and educate us."